Euro 2012 began with something of a bang yesterday evening when Poland and Greece fought out a 1-1 draw. There was shambolic defending, goals, red cards and a penalty, more than enough to keep the watching public entertained, but in truth from a game as hectic as this it can often be tough to draw any statistical conclusions. Much of the focus before the game had been on Poland’s Borussia Dortmund trio of Lukasz Piszczek, Jakub Blaszczykowski and Robert Lewandowski and so it was no surprise that, while the Poles were dominant in the first half, those three were particularly prominent in the game. And it is on these three that I will focus during this piece. Piszczek, a 27-year-old right back, is noted for his constant runs up and down the right flank, and so it is certainly no surprise over a third of his touches (excluding throw-ins) of the ball came in the attacking third of the pitch. His crossing may not have been overly successful on the face of it (one from four) but his general passing in the attacking areas was impressive, with ten of thirteen attempts finding their intended mark. The Dortmund full back also attempted more take-ons (4) than anyone else in the game and was successful with two of them, and though a look at Poland’s player influence map (below) will show how little defensive work he was asked to do, what was required from him he managed well. He won two of his three attempted tackles, made one interception and was successful in both of his attempted clearances. It was a failure of the left side of Greece’s attack (notably Giorgos Samaras) that Piszczek was allowed the freedom to roam so high up the pitch and was rarely called upon to fulfill his defensive duties. For both Dortmund and Poland, Piszczek forms a potent right-sided partnership with Blaszczykowski (who in club football goes by the far more pronounceable, ‘Kuba’). 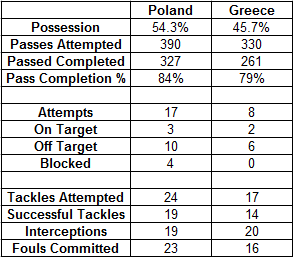 Given this, it is no surprise that 16 of Poland’s 25 attempted crosses during the match came from the right half of the pitch, and had a few more of them connected then they may have been able to walk away from the game with all three points. Between them, Piszczek and Blaszczykowski accounted for eight of those 25 crosses, and were successful with one each. In a one-off match that may look like a poor return for two players upon whom their team relies so heavily, but to put it in context, that 25% success rate is exactly the same as managed by Antonio Valencia, perhaps the best crosser of a ball in the Premier League, over the course of the 2011/12 season. Indeed, Blaszczykowski’s one successful cross led to the opening goal, a deep effort to the back post which Lewandowski met with a well-directed header. Overall, however, Blaszczykowski didn’t have the best of games. While his direct running did cause problems, and he created the goal, his short passing was often wayward, completing only 16 of 24 attempted (interestingly, in both halves of the game he completed 8 of 12 attempted short passes). He did make two interceptions, one of which was in the Greek penalty area and perhaps should have led to a better chance than it did, but he also committed three fouls and one would have perhaps hoped for a greater influence from such an important player. Moving on to Lewandowski, a player who has been linked with Manchester United in the last twenty-four hours after comments from his national team coach, and in the first half in particular we saw exactly what one would expect from him. When the ball was played into his feet, he held it up well and found his team mates, completing 11 out of 14 attempted passes before half time. He struggled aerially against Greece’s imposing centre backs, winning only one of four aerial duels in the attacking half of the pitch and his influence on the game waned significantly after the break. He attempted only half the number of passes that he had in the first half, and was successful with only three of them. It was noticeable that his attempted passes in the second half were generally of a greater distance than in the first as he became isolated with Greek attacks pushing his team mates back. Lewandowski is, of course, the team’s main goal threat, and during the match he managed four attempts on goal. Three were from wide on the right of the penalty area, and none were on target. The only one which did hit the target, his header from in front of the goal, saw him score and he might have had another had Piszczek’s cross been better when Lewandowski got in front of his marker on the six yard box in the first half. Overall, the Dortmund trio probably got pass marks, but given the shambolic nature of much of the Greek defending throughout the game, should have done better. Alongside Ludovic Obraniak, the Bordeaux midfielder, they form a potent attacking threat and if Poland are to progress through the group stage, they will need to up their level of performance before Tuesday’s meeting with Russia. There was only one Premier League player on show between the two teams, Arsenal’s Wojciech Szczesny, and it wasn’t the best of games for the goalkeeper. He completed only 9 of his 17 attempted passes, and had a particular lack of success with long balls up towards his attacking players. He also, of course, made a mistake which led to Greece’s equaliser, gifting the ball to substitute Dimitris Salpingidis, and then later fouled the same player, conceding a penalty and earning himself a red card. The red card means that Szczesny will miss Poland’s game with Russia on Tuesday, but he will be available for selection for the final group game against the Czech Republic. Categories: Arsenal (NN), EPL Index Featured Article, EPL Index Match Report, Euro 2012, and Poland.' 'Tags: Borussia Dortmund, Euro 2012, Greece, Jakub Blaszczykowski, Lukasz Piszczek, Poland, Robert Lewandowski, and Szczesny.